Got snow? This question may seem insignificant in a desert environment, but the answer can mean billions of dollars to agricultural and hydropower industries that rely on accurate estimates of snow cover. Snows that accumulate in mountain ranges (known as snowpack) are the natural water towers of the world. In the western United States, winter snowfall in the mountains provides 50 to 80 percent of our water supply. Therefore, understanding seasonal delivery and distribution of mountain snow, a snowpack's storage and water release potential, and the effects of climate and climate change on such processes is increasingly significant. The variability of snow distribution has a large impact on water resource management decisions. Reservoirs, dams, and other water retention structures need to be managed to maximize water storage for agriculture, hydropower generation, and municipal water consumption. Water managers must also maintain adequate storage capacity to accommodate excess water during floods. This balancing act can result in billion dollar losses for industry if shortages occur, or in losses due to flood damage if supply exceeds storage capacity. In the mountainous regions of the western United States, snow water equivalent is the primary water storage variable for calculating potential runoff during the winter and spring. Snow water equivalent values tell scientists how much water the snowpack will yield when it melts; heavy snow, for example, will provide more water than will dry powder snow. The rate of snowmelt is largely dependent on elevation. Therefore, estimates of snow water equivalent at various elevations are especially important for runoff forecasting and improved decision making. Currently, point measurements at individual locations are used as an index of the snow water equivalent at different elevations. 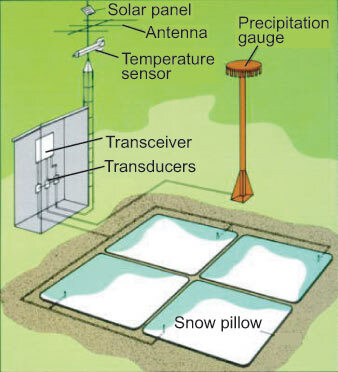 The Natural Resource Conservation Service provides these point measurements as part of their national Snow Telemetry (SNOTEL) station network. 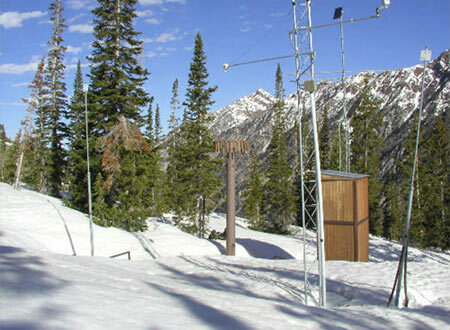 The SNOTEL stations were, until recently, one of the only ways to estimate snow cover over a wide geographic area, although the accuracy of the data they supply are limited for two main reasons. First, snow does not fall in an even layer over a landscape. The steepness of a mountain, the density of tree cover, the direction a slope faces, and the location of a mountain in relation to the sun all influence where snow falls, how deep the accumulation will be, and how quickly it will melt or evaporate. Researchers need access to SNOTEL sites, so most sit on level slopes, often in forested areas. Thus the site may receive more snow than the steep mountainsides above it, and may be more protected from strong winds and the sun's rays. Using the snow depth and weight at the SNOTEL site as an average cover for an entire region can lead to incorrect estimation of total snow-covered area. Also, the sparse sampling density of the SNOTEL network limits their value in representing conditions across the landscape. Although the data are used as if they were averages, they represent only discrete points between which data must be estimated or generalized. To provide a more comprehensive inventory of snow water equivalent, which would improve runoff forecasts, and to develop the next generation of operational hydrologic models to forecast streamflow, researchers need data that provide a comprehensive estimation of snow water equivalent across the landscape.